Well I'm here today with my DT post for Noor Design UK, I've missed 2 weeks as so many things have been going on in real life so took a break. However I am back now & you can expect things to return to normal.........though I'm far from normal hee hee. I have used the fabulous Lemoncraft Everyday Spring 12x12 papers, these are so colourful & bright & go with anything. As always I have machine stitched all around the edges. The seam binding is one I coloured myself. The centre piece is actually a Brad from Noor Design UK, these I love!! Underneath is a Fantasy die & also along the edge is another Fantasy die. Talking of Fantasy dies, have you seen all the new ones Tracy has recently added........soooooo fabulous!! I have took a photo of the inside before I add somewhere to write on just to show youhow pretty these papers are. As you can see I have also added the Fantasy die inside too along the edge. 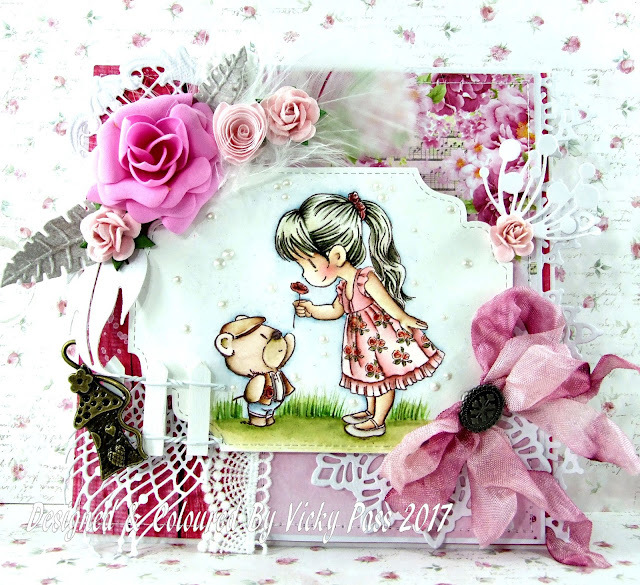 The fabulous stamp is one of my favourites I absolutely fell in love with this the second I saw it......how darn cute is Teddy there!! So this cutie is called 'Send Me Flowers' & I stamped onto Fabriano & coloured with distress ink refills. I dont remember the colours as I coloured this up about a month ago. I also added pearl dots randomly with a pearl pen & cut it out using Little Darlings Fancy Rectangle die.....probably my most used die lol. 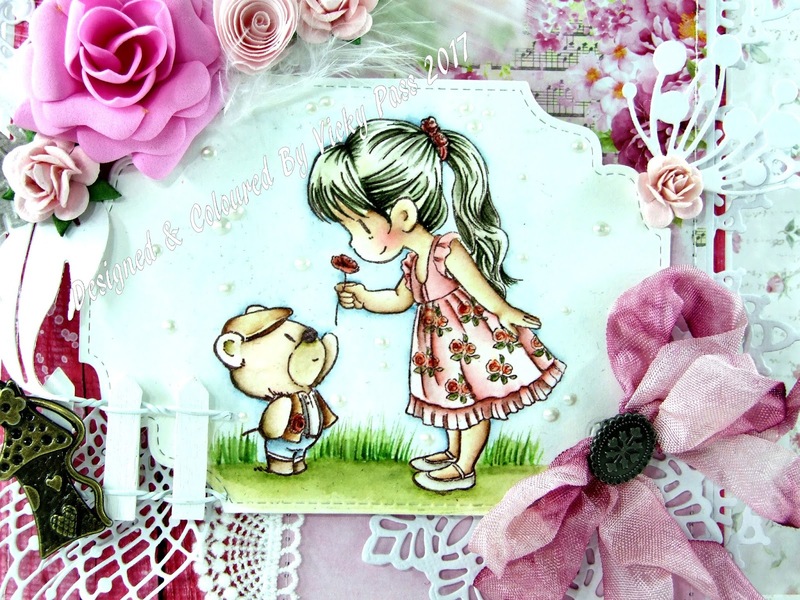 Have you seen the utterly dorable wooden fence..........how cute is that!!! I added a charm on top of it to add to the whimsical charm of it all. 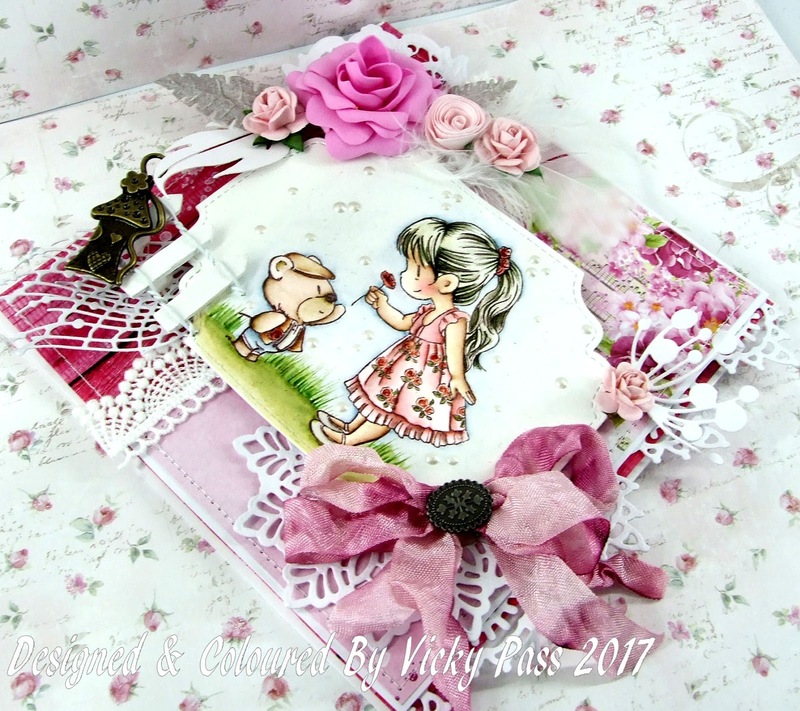 I added WOC flowers & the large flower is made from Foamiran which I made a few weeks ago with the newest release of Rosy Owl dies. I also added a feather underneath. The rolled flower is form my stash. Until then why not go have a splurge in Tracy's shop where you can find sooooooo many goodies........seriously you will be spoilt for choice.